Browse slideshow to see artifacts from Buttermilk Creek, Texas, date to about 15,500 years ago. For decades, one name has dominated discussion of the ancient New World: Clovis. Tools representing the characteristic Clovis technology, first found in Clovis, New Mexico, in 1929, have long been considered the product of the first inhabitants of the Americas. With a tool style that’s been found across much of North America, Clovis was the best-selling brand in “the first Americans” competition. Clovis technology is apparently a home-grown phenomenon, as it’s never been found in Northeast Asia, the source of migrants into the New World. The oldest solid date for Clovis people is 13,100 years ago, says Michael Waters, an archeologist at Texas A&M University. Now, in an article in Science on March 25, Waters and colleagues argue that tools have been found near Austin, Texas, that date to 15,500 years ago. The researchers found 15,528 artifacts at a site called Buttermilk Creek. 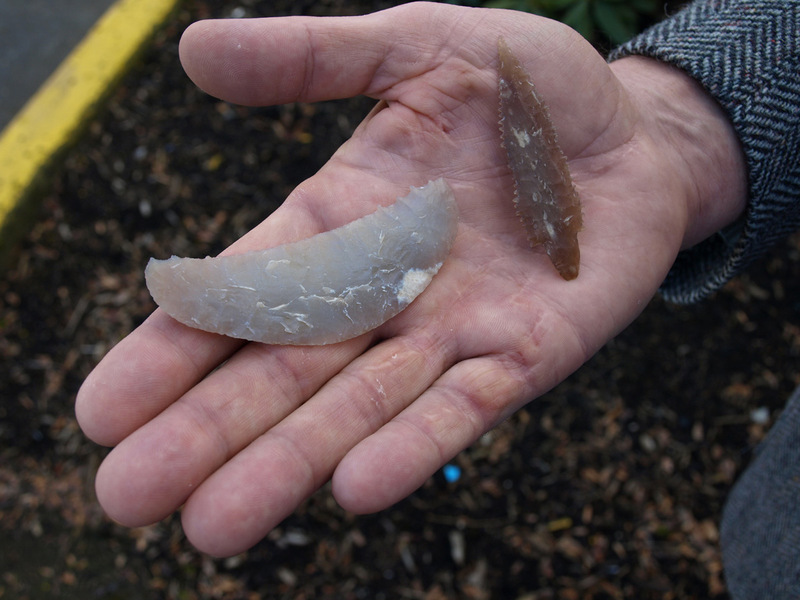 Most of their finds were flakes busted off while making stone tools, but the site also yielded 56 stone choppers, points and scrapers. Using a technique that calculated when an object was last in direct sunlight, “We took the most conservative route to estimate the age,” says Waters, who directs the Center for the Study of the First Americans at A&M. The stone tools and flakes were probably made by a band of hunter-gatherers who paused at the creekside site. The Clovis tool style was marked by the lengthwise groove, a sophisticated bit of stone-work that probably helped secure arrowheads and spear points to shafts. Notice how this feature is absent from the pre-Clovis slide show, above? Patience, please! 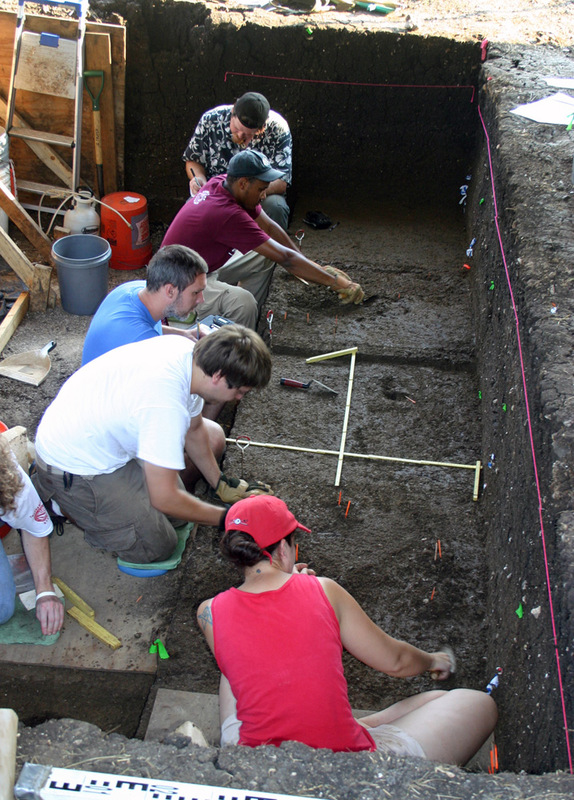 Waters’s team of archaeologists comb the dirt to uncover more prehistoric treasures. The OSL dating, which essentially figures how long something has been buried, took place at the University of Illinois, in Chicago, under the direction of Steven Forman. The find at Buttermilk Creek is the latest — and one of the better documented — archeological sites to break the Clovis barrier. Others pre-Clovis finds have been made in Oregon, Wisconsin, Pennsylvania and even Chile. If many other claims for pre-Clovis dates have failed to stick, is the new find really convincing? What does the new confirmation of earlier occupation say about how people arrived from Northwest Asia? Why have many archeologists resisted the possibility that the Clovis toolmakers were not the first inhabitants of the Americas? Much of the discussion about the Buttermilk Creek site concerns the vertical position — the stratigraphy — of stone artifacts, and the Waters team went to great lengths to show that older material was under younger stuff, as expected in an undisturbed site. Undetected dislocations can confuse archeologists, who tend to think deeper is older and shallower is younger. Are the dates reliable? Even dates from ol’ reliable carbon-dating have been disproved in the past, Bamforth says, but the optical dating used at Buttermilk Creek (which contained no organic material for carbon dating) seems careful and sound. “They have absolutely dated the site, they absolutely have artifacts, and the article talks in great detail about how intact the sediment was, they have really addressed whether the artifacts are in place,” says Bamforth. “They have refitted the [stone] flakes to the tools; I am totally convinced they have an intact site” and solid dates. 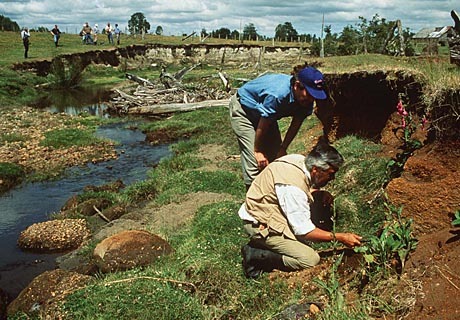 Aware that the latest find may be seen as final vindication for the “Clovis was not first” viewpoint, we phoned Thomas Dillehay, professor of anthropology at Vanderbilt University and the University of Southern Chile, who fought for decades to have Chile’s Monte Verde site recognized as pre-Clovis. Now that Monte Verde is finally accepted as one of the best-confirmed pre-Clovis sites, we figured the experience would make Dillehay receptive to the new find. The age of artifacts found at site in Monte Verde, Chile was long at the center of a heated debate, but the scientific consensus says they are up to 14,500 years old — long predating the first Clovis toolmakers. But due to heat and humidity, such organic material would not be preserved in the Texas site, he says. The timing of human occupation of North America bears heavily on their migration route from Northeast Asia, which is accepted, for geographic and genetic reasons, as the source of the first Americans. The melting of the last ice age during the Clovis period, starting roughly 11,000 years ago, producing an ice-free corridor through Northwest Canada that would have allowed transit into the North American interior. A confirmed pre-Clovis date means the first Americans must have migrated by boat along the West Coast, as the ice-free corridor was ice-full around 15,000 years ago. But the region was clogged with glaciers a few thousand years earlier, meaning that any early immigrants would have moved along the coast, either on foot, or via short hops in boats. The possibility of coastal movement got a boost in a study1 published March 4, which reported the discovery of stone tools dating from 11,400 to 12,200 years ago on the Channel Islands west of Los Angeles. The recent discovery of delicate stone weapons on California’s Channel Islands boosted the theory that the first Americans could travel by boat while entering the Americas. But even if people did move south along the coast rather than inland, Dillehay says they probably needed a long time to reach Chile. “There are hundreds if not thousands of rivers that descend the western slope of the mountain chain from Alaska to Tierra del Fuego, and every river, whether major or secondary, is a temptation to head upriver,” slowing the overall southward movement. And if Monte Verde was occupied by 14,500 years ago, this logic suggests that people reached North America much earlier than even the 15,500 pre-Clovis date in Texas. Should we trademark the “pre-pre-Clovis” brand? 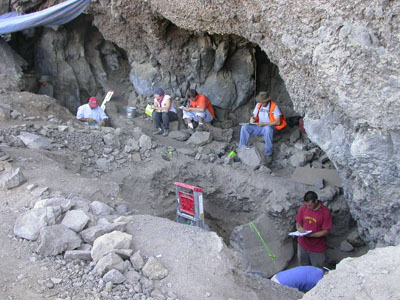 In Paisley caves in south-central Oregon, researchers uncovered pre-Clovis artifacts and the oldest human DNA discovered in the Americas. Radiocarbon dates show that people lived in the caves between 12,000 and 14,340 years ago. 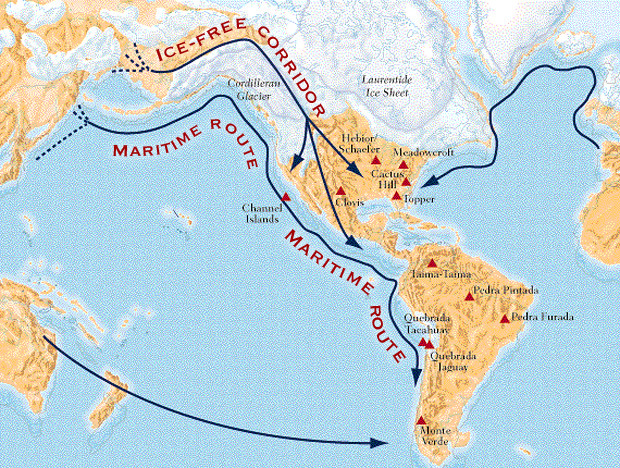 Where did immigrants to the Americas come from more than 10,000 years ago? Why is this region considered the most likely source? Were all claims for pre-Clovis inhabitation rejected based on poor scientific evidence, or were some rejected for other reasons? How does the increasing acceptance of pre-Clovis inhabitation change our understanding of the ancient world? “You build a reputation based on a particular perspective,” says Bamforth, “and it’s hard to see evidence that is in opposition; we all believe we are really good at what we do.” Those who gain fame for overturning the conventional wisdom can wind up in the opposite corner, defending their own views long after contradictory evidence arises. Some early claims for pre-Clovis sites were based on faulty excavation or inaccurate dating, which left a tradition of doubt, Bamforth says. For example, erroneous radiocarbon dates arose after dig sites were contaminated with groundwater. And European-style artifacts unearthed in the Hudson River valley, once interpreted as evidence for ancient European immigration, actually came from ship’s ballast that was dumped into the river, Bamforth told us. Clovis-first is dead, at long last! After 40 years of assault, Clovis-first seems dead at last. The Texas find “anchors the fact that people were here in the 14,000 or 15,000 year range, there is no longer an argument with that,” says Bamforth. Happy tax day: Meet bureaucracy's roots! Dating the Caveman: “Last” Neanderthal Found?